Piano Instrumental: Vineyard Music EXTRA! 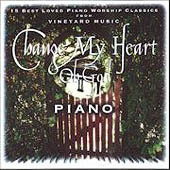 Anaheim, California  Following the incredible success of Change My Heart Oh God Volumes 1 & 2, Vineyard Music Group proudly presents Change My Heart Oh God, Piano, 15 best loved piano worship classics. This album features the most popular songs from both Volumes 1 & 2. Each song was carefully selected and woven together to give the listener a wonderful taste of Vineyard music. The instrumental versions of these songs are done in true Vineyard style with the talented and gifted pianist Michael Gettel. Pianist and composer Michael Gettel began studying piano (and trumpet) at the age of eight. Gettel learned the craft of composing and arranging in a jazz/pop style and by age 19; his talents lead him to work with such jazz luminaries as Steve Reich and Chick Corea. Michael Gettel appears courtesy of Narada Records. Songs Include: Change My Heart Oh God; At The Cross; Draw Me Close; Light The Fire Again; Praise Song; Faithful One; Its Your Blood; Good To Me; RefinersFire; I Believe In Jesus; Isnt He; Eternity; Holy And Anointed One; More Love, More Power; Take My Life.